Hey there... happy Wednesday! Rosemary here today. As I am sure most of you know the Spring/Summer Coffee Lover's blog hop is in full swing! A Jillian Vance Design is a super sponsor and that means that there is a super prize up for grabs if you participate in the hop... what are you waiting for? 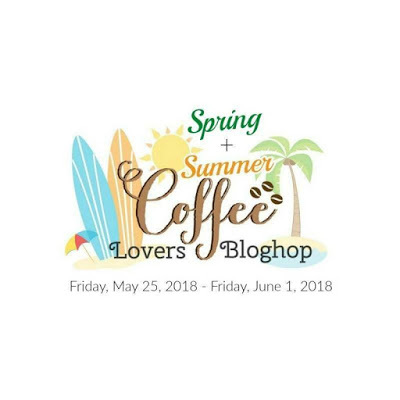 With the blog hop happening I decided that my card today with have a theme that tied into the blog hop. For me that means something tea related. 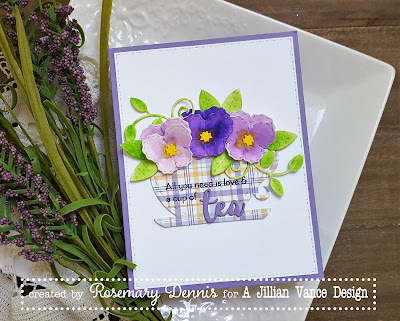 I used the very pretty Pansy Die set along with Coffee Tea & Me die set to create my card. I started my card by die cutting the smallest pansy from watercolor cardstock and then coloring them with ZIG Clean Color markers and clean water. When I had a color I was happy with I added some yellow to the center of the main flower. Once they were somewhat dry I made small cuts into each flower to allow me to shape them a little bit and then I adhered the pieces of each pansy together. The centers were die cut from the watercolor cardstock and colored with a yellow ZIG and then added to the centers of the flowers. The tea cup was die cut from some purple/orange/green plaid paper using the tea cup die from the Coffee, Tea & Me set. The word tea from the same set was die cut multiple times from purple cardstock and then adhered together. 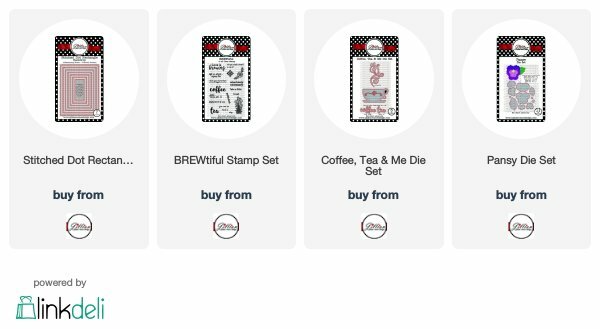 I stamped the sentiment from the BREWtiful stamp set on the tea cup in black ink and then added the die cut word. Some white cardstock was die cut with the largest Stitched Dot Rectangle die and adhered to a purple cardstock base. The teacup was adhered and then I added my pansies. To finish the card I die cut the Swirly Vine die from watercolor cardstock and then colored it with a green ZIG marker. The piece was cut apart and pieces tucked in and around the flowers. Going to add this to the Simon Says Stamp Wednesday challenge of anything goes. Have a wonderful day and enjoy the hop! Pansies are one of my favourites - I adore how you used them here with that sweet cup. Absolutely beautiful card, Rosemary! Love the look you got with the Zig coloring & that wonderful plaid cup! This is so pretty! I love those pansies! So pretty with Pansies, love it! Fabulous card - just love the blossoms in the cup!! This is SO creative and pretty. I love how you did some stamping, but then added "real" flowers for dimension. Lovely! love the pretty plaid cup. Those pansies are fabulous. So gorgeous with the pansies in the cup. Oh so beautiful! You've now added to my wishlist... those pansies!!! Well, of course the cup was already on my list...lol! Love this! Wow! Gorgeous pansies and colors!!! So cute with the pansies and the plaid cup. These are beautiful flowers !